Your diet has a large impact on nitric oxide (N-O) production. Beets, spinach, kale and any leafy greens are rich in nitrates. As you chew these foods the good bacteria in your saliva converts the nitrates into nitrites. Once in the stomach, the digestion continues acting on the nitrites and converts them to nitric oxide, among other compounds. The antioxidants contained in these vegetables react with the nitrogen dioxide produced by the digestion process, scavenging the oxygen molecule, to reduce it to still more nitric oxide. Once completely digested, the N-O is then absorbed through the intestinal tract and pasted into the bloodstream. Why should all of this be of interest to you? Because nitric oxide circulates through your body helping to keep it alive. Your heart uses it to keep pumping vital nutrients and oxygen throughout your body. N-O is also produced in the lining of our arteries, but as we age the body does not produce as much nitric oxide. Studies show as you complete your 4th decade of life, your body is only making about half, if not less then half of what it made when you were 20. That is why it is important to eat a variety of nitric oxide containing plants, and our featured recipe fits the bill. 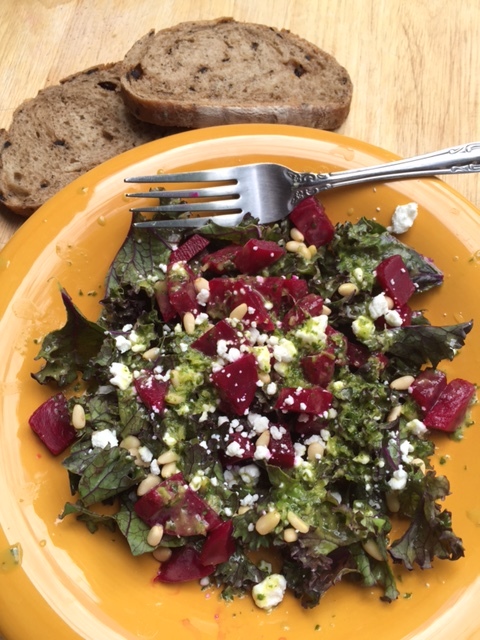 Our featured recipe is: Red Kale Beets and Sweet Cilantro Vinaigrette, and here is what you will need. We’ll start with the vinaigrette. Place all ingredients into a blender or food processor, and blend or process until smooth. Place into a jar with a tighten lid, and store in the refrigerator for up to 10 days. Remove leaf parts of kale from steams and wash under fresh cool water. Next cut kale into smaller bite sizes portions with a pare of kitchen shears and arrange on a dinner plate. You have the option to use canned beets (preferably organic grown), dicing the sliced beets into 1/2 inch squares. If you chose to use fresh beets, slice the beets, about 1 inch slices, and place into a steamer, until slightly soft. Remove, and cool a bit, and dice into 1/2 inch squares, making a 3rd of a cup. Arrange the beets over the kale. Next add the pine nuts and goat cheese. Drizzle with Sweet Cilantro Lime Vinaigrette, and enjoy with slices of olive bread (we used an olive bread made with olive oil and black olives, no canola oil) or your favorite bread . This entry was posted in Dressings, Marinades, Salsas and Sauces, Soups and Salads and tagged beets, Black pepper, cilantro, Digestion, digestion process, Goat cheese, Himalayan salt, Kale, Lime (fruit), lime juice, nitric oxide, olive bread, Olive oil, orange juice, pine nuts, red kale, Sea salt, Sweet Cilantro Lime Vinaigrette. Bookmark the permalink. 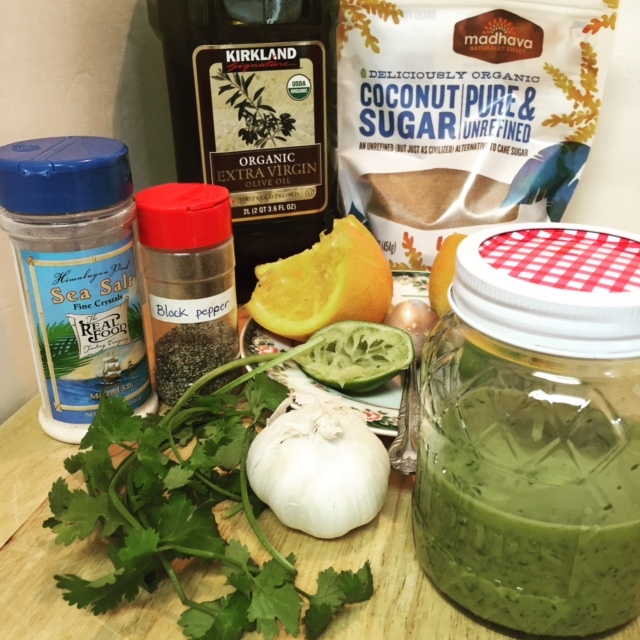 Refreshing salad recipe and thank you for the link to my post.